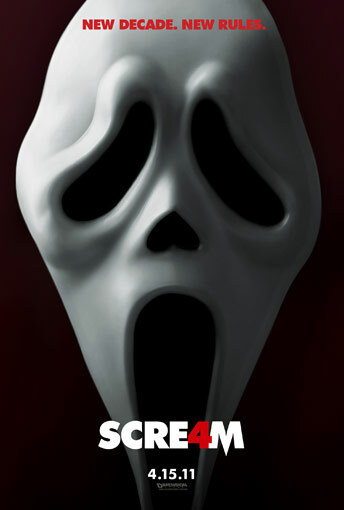 Scream 4 was made in 2011 but it was almost like taking a step back in time to the 1990’s. Full of nostalgia along with the usual cast of characters. Reprising their roles from the original 3 movies are Neve Campbell as Sydney Prescott, David Arquette as Dewey Riley (now the Sheriff), and Courtney Cox as Gail Weathers – Riley. The storyline is drawn out nicely and somewhat predictable. I mean how much more could they really do with it, but they did a good job of bringing the old characters back and introducing new ones to relate to this generation. Young stars include Lucy Hale, Britt Robertson, Hayden Panettiere, and Erik Knudsen. Most of these actors and actresses are virtually unknown but so was Neve Campbell when the first Scream came out. Sydney Prescott now an accomplished author comes back to the town she grew up for her book tour. Low and behold the murders start again. Dewey, now the Sherriff of Woodsboro and married to Gail Weathers (looking a little rough I might add) find themselves in the middle of it again. As far as the rest of the story goes, you already know it. The phone calls start along with the murders, Sydney and her relatives are terrorized by someone with a voice box and a ghost face costume.